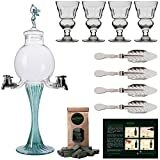 Imported from France, this is an Authentic French Absinthe Fountain Set. The fountain is handmade from mouth-blown glass and plated brass, and the set includes four 1-oz. absinthe glasses and four stainless steel spoons with machine-tooled perforations. The set is the same one used in La Louche, an ubiquitous ritual performed at French absinthe cafes in the 19th-century. Ice water is slowly released from the fountain over a sugar cube that is held by the slotted spoon as it rests atop the absinthe-filled glass. As the water drips from the spigot, it dissolves the sugar into the absinthe, creating the milky, iridescent cocktail favored by Vincent Van Gogh and Pablo Picasso. 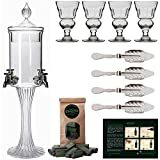 The absinthe fountain has four metal spigots that open independently, the glass bowl holds nine cups of ice water, and the four mouth-blown glasses are etched with doser marks for measuring the correct amount of absinthe.